I’m fairly certain this is the stone representation of my muse, Clio. Clio is the muse of history. 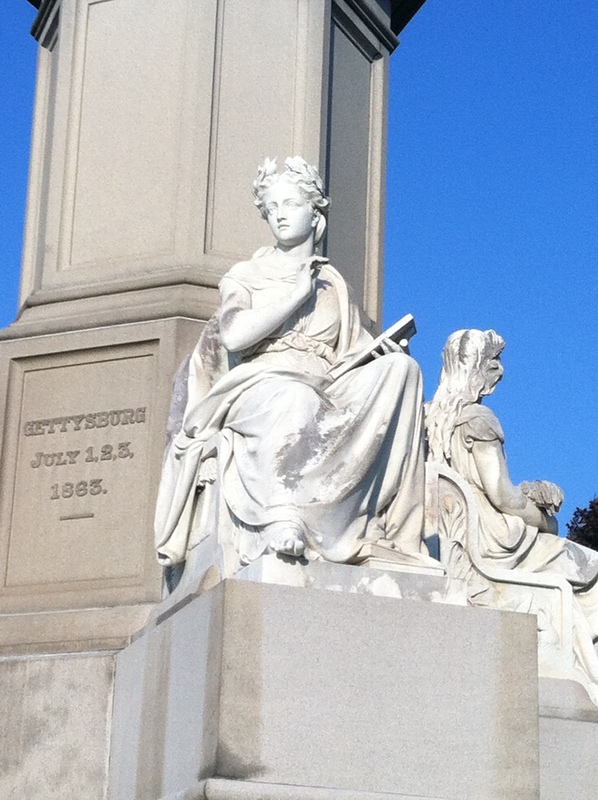 And this is Clio on the Soldier’s National Monument in the National Cemetery at Gettysburg. War is telling Clio the history of what happened at Gettysburg and she’s writing it down on her tablet, along with the names of the dead. Maybe I’m Clio personified (okay, way creepy. Let’s forget that comparison). Clio has been super good to me after our latest trip to Gettysburg. Too good, in fact, because now I’m up to three–three–ideas for novels. Three plots. Three time periods. And only ten fingers to type with. Not to mention the approximately twenty-seven minutes of free time I have on a daily basis. What to do, what to do! So, yeah, it feels good to be inspired after the pseudo-mourning I went through after finishing Anything You Ask of Me. But, seriously, I just don’t know which idea to go with. It was only, what, two blog posts ago that I was all excited about the contemporary and the possibilities associated with writing in the present day. I kind of still am. But now I’m like, oooohhhh, 1863: I love you! Ooooooohhh….Grand Army of the Republic in 1913: I love you too! Horrifically, I’m thinking I’m just going to write out rough plot outlines (gasp!) for each on my lunch break and just go with whichever one I can crank out fastest. I know, I know. I think we all know which one that’s going to be. Maybe we’re wrong. Maybe contemporary ideas will burst forth like proverbial flood gates. Anyway, so I’m all inspired. I’d be happy to hole up somewhere with my laptop and just write until my fingers bleed (which, I guess isn’t too far from impossible, seeing as how I got a blister from a sock when at the writer’s conference. Yes. A sock). Obviously, that’s not going to happen. 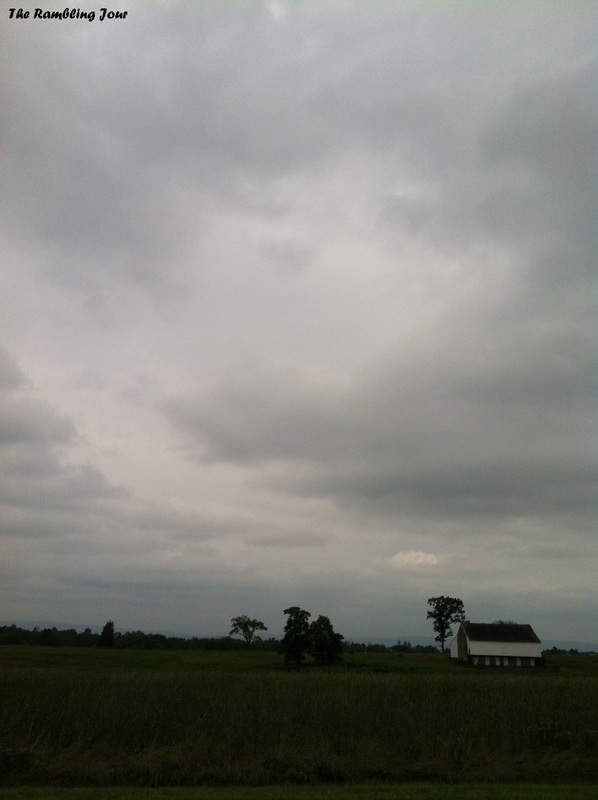 But in lieu of that, I present Inspiration from Gettysburg: The June 12, 2013 edition. 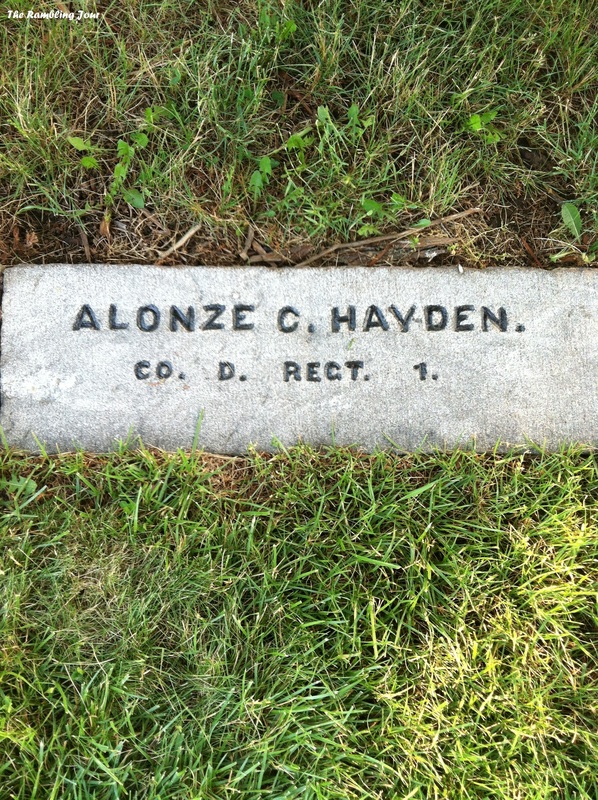 When we were in the National Cemetery, I visited the grave of Alonzo Hayden. 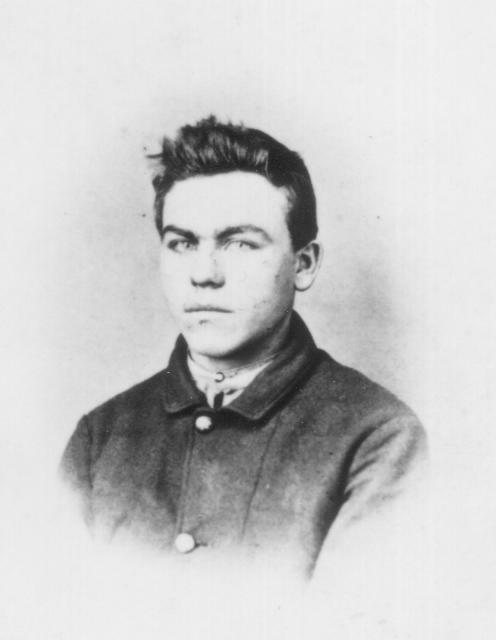 He was a private in the 1st Minnesota and was killed during the battle, not far from where the Pennsylvania Monument stands today. The Hubs and I had a discussion when we visited Evergreen Cemetery a few trips back: seeing the grave of someone you read about makes them real. Example: You run around the battlefield and you see the Trostle farm, the Weikert farm, Spangler Spring, Culp’s Hill; you hear the story of the Kitzmillers and the Zieglers and the Codoris. But then, when you see their grave, they stop being sites and start being people. These are the people who stood in Gettysburg after the battle. This is Jacob Weikert finding dead Confederate soldiers in the rocks by his farm. This is Mr. Spangler, who owned the spring where soldiers filled their canteens on July 2nd. This is Mr. Trostle, whose barn still bares the scars of the artillery shell that blasted through the brick facing during the battle. These are the Culp sisters, whose brother Wesley was killed on Culp’s Hill and his body never found. And this is Alonzo Hayden. He was a farmer. He was 24. When we were wandering around the visitor’s center, you know, not paying to actually tour the museum but instead just browsing the bookstore, we found the one free tour we could go on: The tour of the Spangler Farm. The farm, though purchased in 2008, just opened to visitors a few weeks ago. As in the weekend of May 25th. The object of my affection Francis Barlow was treated at the Spangler Farm after he was wounded. General Armistead died in the summer kitchen. The ceiling of the summer kitchen is really low; it’s just a small stone building with a fireplace in it. The floor looks like it’s been replaced. 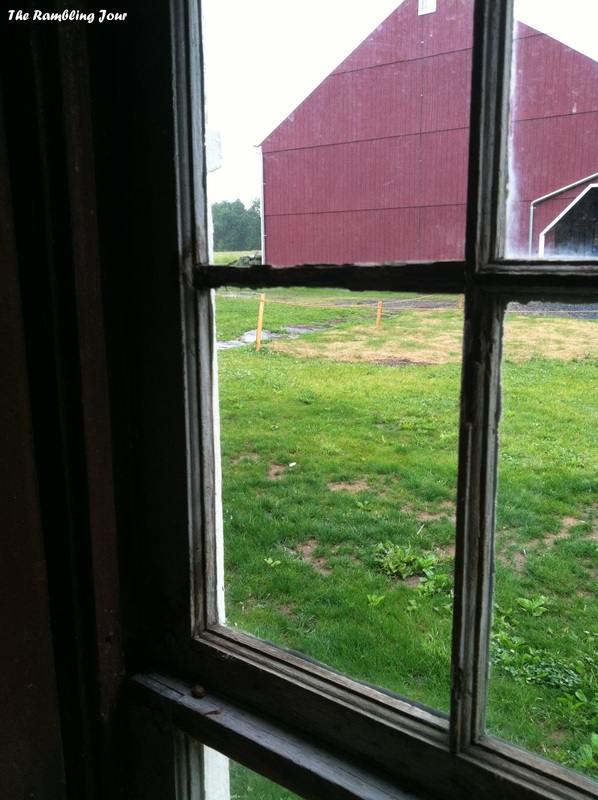 But as I looked out the window towards the barn, it was pretty easy to imagine General Armistead looking in the same direction, seeing the same thing. Those are the creepy, quiet moments where you can imagine them still being there. I feel the same way at the Trostle Farm, when no one else is around. I think it’s the fact these buildings were silent witnesses to the battle. The same thing with the McPherson Barn. I’ve always loved it–this far off stone and wood barn way off in the distance. There’s just something about it. There’s nothing else in the field. The rest of the farm is gone. And, finally, in a special “sneak peek” of my next novel (and yes, we all totally know the Civil War one will be the next one. Sorry contemporary. It’s inevitable), sometimes I specifically seek out inspiration. And…not just seek it out, but scale a stone fence, leap through high grass, and battle ticks and blisters to get my picture taken with it. Take that sedentary lifestyle! All this leaping and bounding and scaling. Totally uncharacteristic of me. Anyway, there’s a monument that you really can’t see unless you wander off the main road, down a gravel driveway that you may or may not be allowed to wander down. I can’t tell. There’s no sign specifically saying keep out, so I’m assuming it’s park property. Anyway. 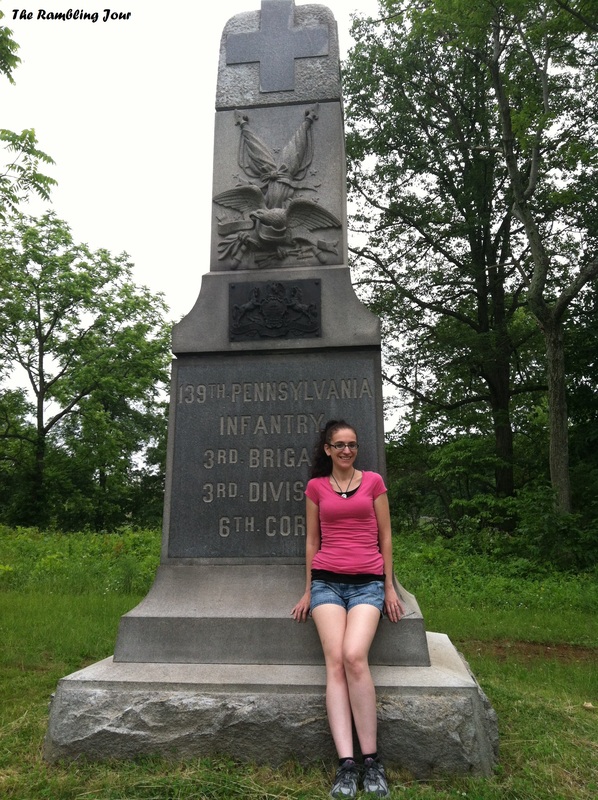 The monument is for the 139th Pennsylvania Volunteer Infantry. Company B was raised out of Kittanning, Pennsylvania; they trained at Camp Howe in Pittsburgh. 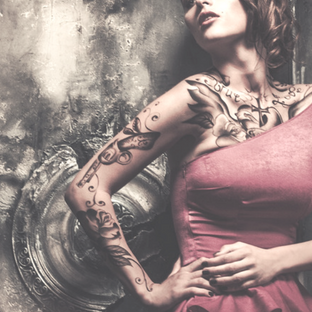 I’ve written a whopping five pages of the novel thus far (enter return of Manuscript!) and none of it has to do with the 139th. But trust me. It will. And until then, here’s my awesome posture and super excited expression about getting my picture taken with their monument. If I can write this much after just a couple of days bee-bopping around the battlefield (Things I may have been overheard saying, “I don’t understand, the sign says they don’t serve visibly intoxicated people and I am, in fact, visibly intoxicated.”), just think what will happen after the 150th Anniversary in a few weeks. Look out kids. I might just get a tad overwhelmed. Previous PostGettysburg! Sunburn! Ticks! Many a splendored thing! Next PostHuge error in book buying judgment: Enter the Epic Fail.